Why did the medals go to Tove Alexandersson, Maja Alm and Natalia Gemperle, what were the decisive moments in the race, and what were the best choices on all the interesting routechoice legs the Women’s WOC 2017 Long distance course had to offer? This article attempts to answer these questions based on detailed analysis of GPS-data and official split times. 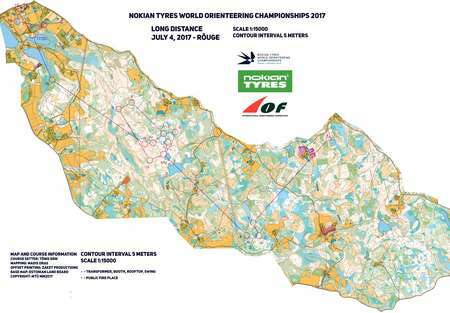 See also the analysis of the Men’s WOC 2017 Long distance – which gives additional insight in the choices to be done in this type of terrain. Especially it can be good to read the introduction in the Men’s article first, at it gives some more background which is not all repeated here. Due to the big spread on different routes and lots of micro routechoices, it is tricky to make an analysis with clear answers, but it is still attempted below. 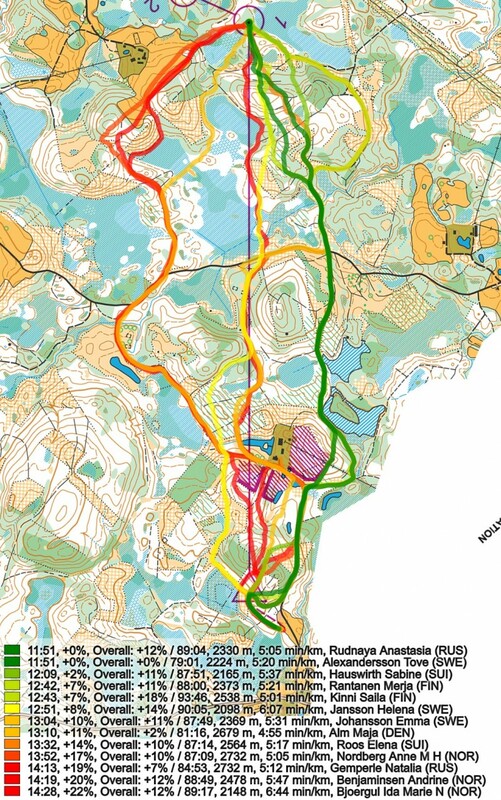 For the women actually route choices, avoiding mistakes and pure running speed is more important than in the men’s class with respect to the medal decisions – in the men’s class micro routechoices were more important; both due to course characteristics and due to runners skills. The women’s course has three long routechoice legs (to control 1, 5 and 16). Focus in this first part is on these three long legs, but the shorter routechoice legs are also interesting and will be given some attention. Clearly running to the right and exploiting the path network there is the fastest main option, although there are several alternatives within that route as well. We can identify the following 4 main alternatives; right, straight and two left options; here the fastest athlete on each alternative is shown. The reason for right being the fastest here is that it is only 200 meter longer than the direct alternative, but has a lot more path running. It is quite risky to dare to run straight to the first control in this type of terrain when there is an option around on path which is not much longer, especially in the women’s class. 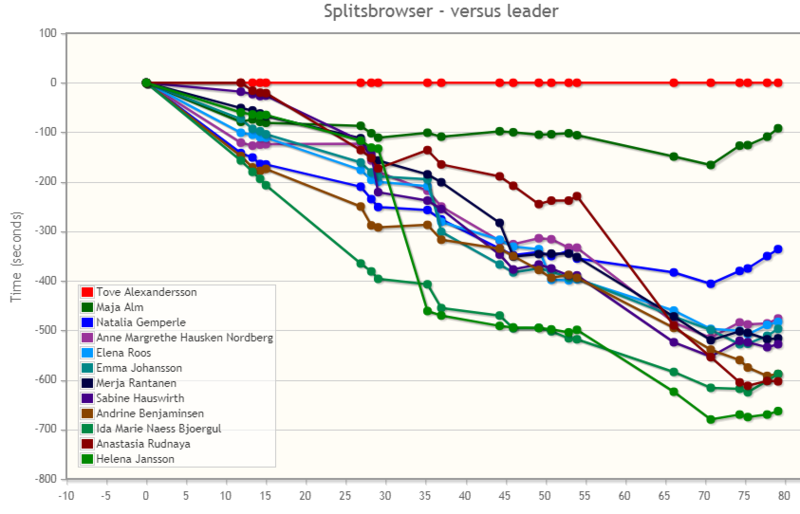 Some did try it, and Helena Jansson does a very good job at it and looses only a minute to Alexandersson. Running all the way to the left is 200 meters longer, and you have a longer stretch you have to run through the rough terrain (the first part of the leg). You could start to the right along the green alternative and then cross over to the red alternative like Natalia Gemperle does, but then you have to run another 200 meter longer. 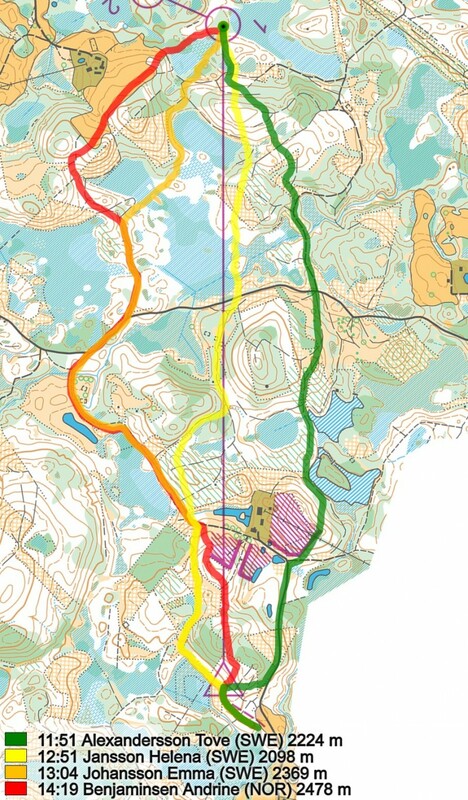 You can cut the left alternative towards the end (drawn in orange below, Emma Johansson’s route), but that will only gain you some seconds – it is still longer than going to the right, and you then need to go even more through the tough terrain. 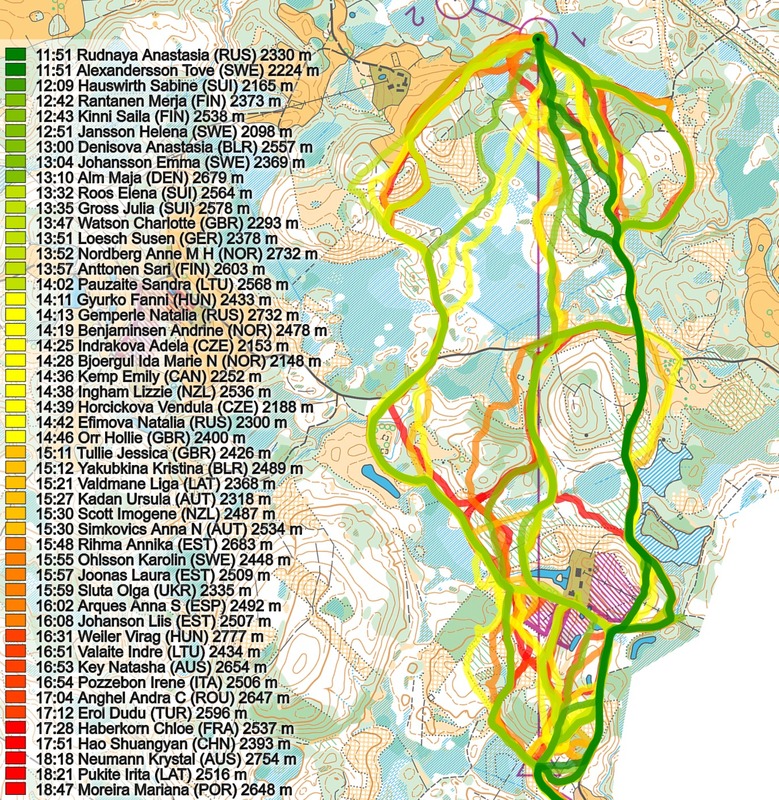 Below you see the routes of the Top 10 in the competition + Helena Jansson and the Top 6 on this leg (this type of illustration is used throughout this analysis). Here you clearly see that the top runners divide quite evenly between left, straight and right – many loosing significant time. At lot of time could be gained by making the right choice out from the start. The leg to control 5 again has a “risk free” alternative to the left where you can run on path/road 70-80% of the leg, and the control is also quite easy to take. 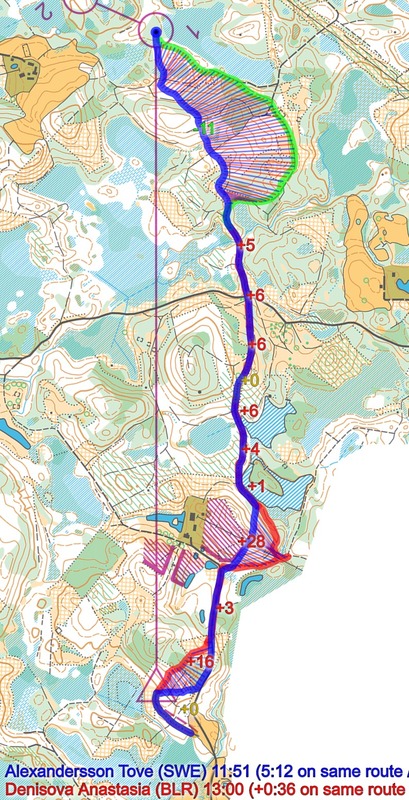 The course setter has been quite kind to the women who are fast runners but more unsecure orienteers by offering this choice, and many of the athletes take the offer. As you can see from the below illustration, you can run quite well to the right, but execution is difficult, and even if you run it well, you will loose nearly a minute. With the left route being only around 100 meters longer, it is surprising that still quite a few run to the right. It might be that going to the right looks shorter than it actually is, but due to all the small curves you must take, it gets quite long. Note that there are two different alternatives to the left. You can either go left out of the control and through the green down to the road, or go straight through the open and semi-open area to the road. Clearly the rightmost option is fastest here, and actually surprisingly much. Gemperle looses 50 seconds by going left. 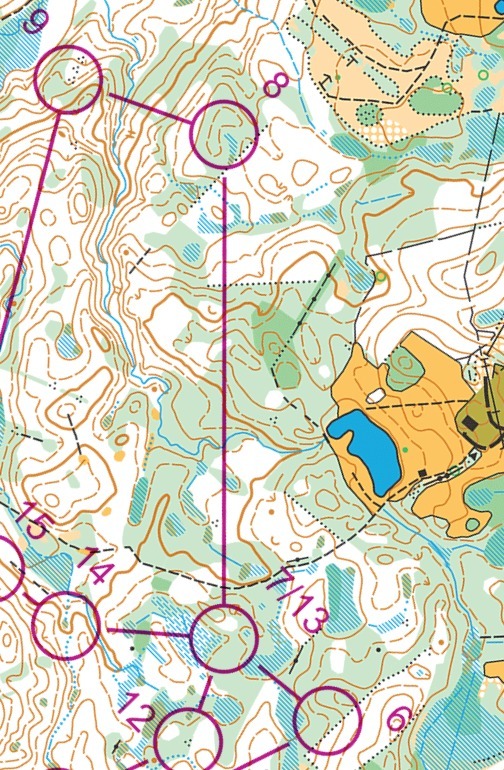 The key to this leg is to avoid the green area with marshes at the middle of the leg; either go right to the lake/open area or left on the ridge in “white” forest. 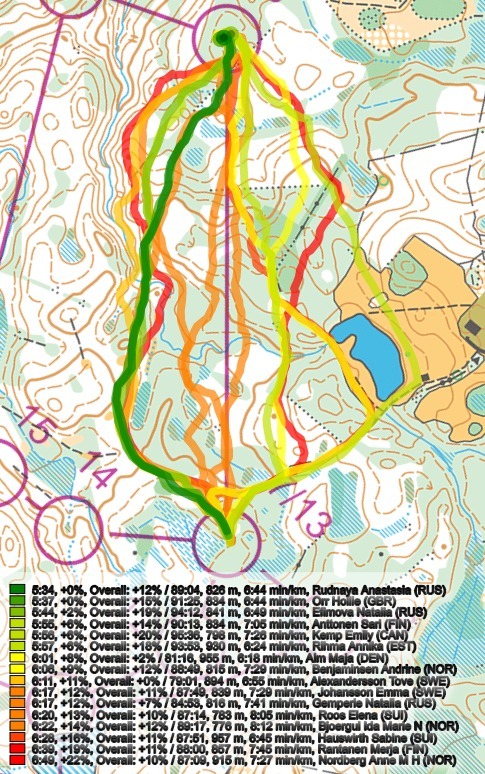 The four fastest times are actually run to the left; this looks to be a typical example of the guidelines for this type of terrain which Aigars posted as a comment on the men’s analysis article. 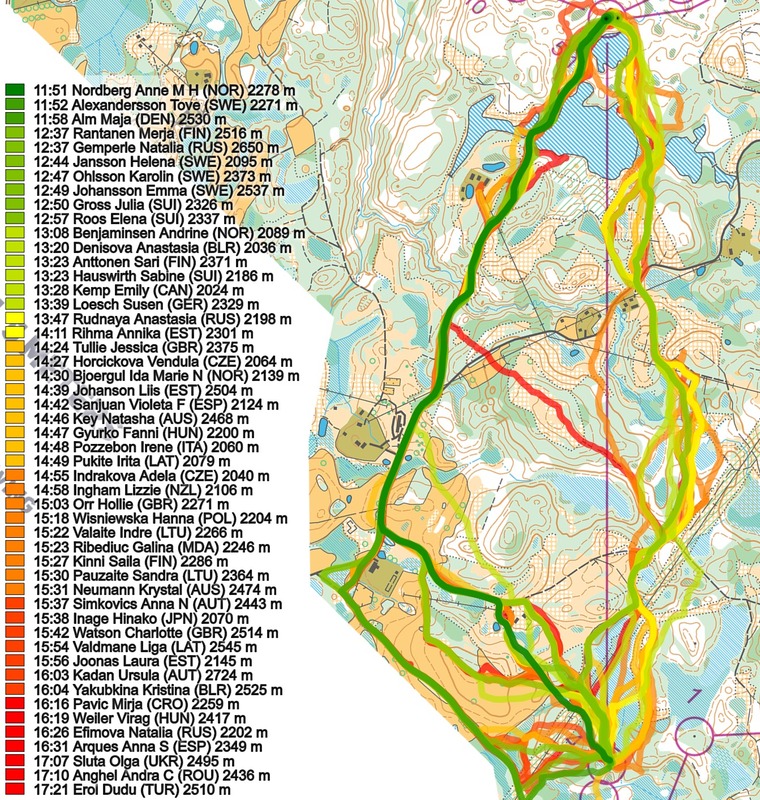 On leg 10 we have started to get into a different type of terrain with more contours and relatively good runnability. The ridges are good to run on, and you should either take the ridge to the left or the ridge to the right. Again execution is very important here, it is easy to loose a minute if you do not manage to get the flow. Leg 17 is a leg which looks quite much like a sprint leg, a small “trap” laid by the course setter towards the end of the course. A few of the top runners actually go in this trap and loose significant time; more about that in part 2 of this analysis. Another “sprint type” leg with some opportunity to gain or loose time on your competitors. 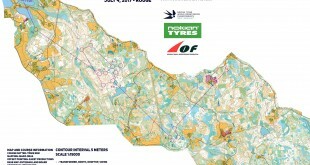 One can discuss if this is necessary – the qualities needed in the forest are maybe more important in order to decide who is the world’s best long distance orienteer than this area towards the end of the course. Here we take a brief look at the decisive moments in the race, that is were the winners won and the others lost. Let us start to repeat the overall results, to see how far each runner was from a top result. 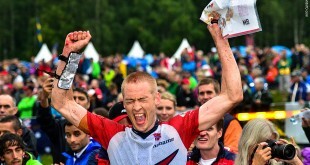 As you can see, Alexandersson won a clear victory. Easily distinguishable is the fact that most of the significant time losses are on the longer legs, especially the first and 16th leg. 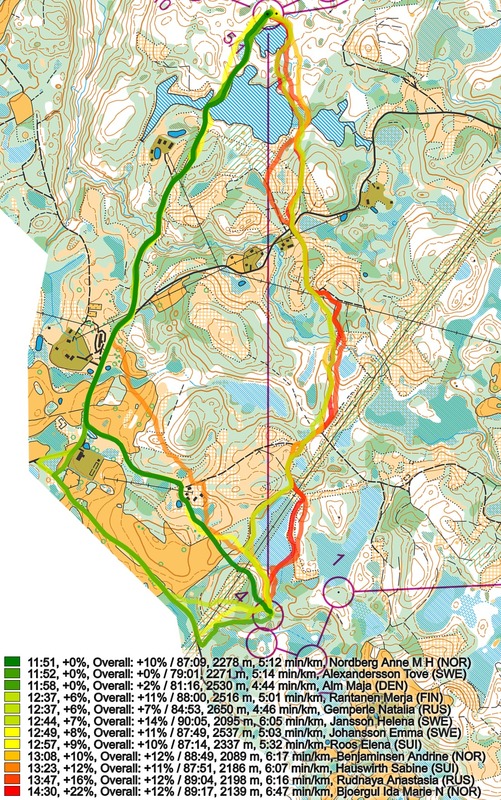 Also, the mistake by Helena Jansson at the 8th control which takes her from 3rd place and out of the game is clearly seen (green line going steeply downwards after 25 minutes running) and Anastasia Rundnaya’s wrong route choice at the long leg to control 16 which takes her from a clear 3rd place to a place outside the medals (brown line going steeply downwards around 50 minutes running time). To the left you see the leg times for the Top 10 overall in addition to the fastest on this leg. To the right you see the total times. This first leg is already very important for the medal decisions. 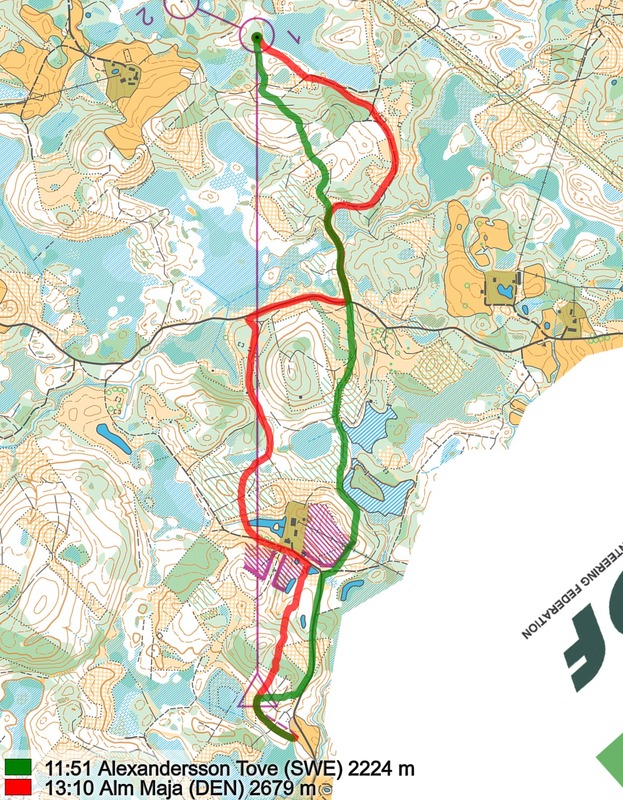 Maja Alm looses 1:19 here by taking an interesting double-S shaped route which is 400 meters longer than Alexandersson’s route. Compare this to the 1:32 Alm is behind the gold medal in the finish. Anne Margrethe Hausken Nordberg, Natalia Gemperle, Andrine Benjaminsen and Ida Marie Næss Bjørgul all lost more than 2 minutes to the first control (actually all the three Norwegian women) – for both Benjaminsen and Næss Bjørgul 2 minutes faster time would have meant a 4th place – whereas Hausken Nordberg could potentially have been on bronze place. For Natalia Gemperle, bronze medalist, the 2:22 lost on the first control was a big time loss, but with 4 minutes up to the silver medal there were several other mistakes she should have avoided also, to beat Alm on this day. All of these four Top 10 finishers who loose more than two minutes here do it because they run to the left or straight. Both Hausken Nordberg and Gemperle run in an S, i.e. 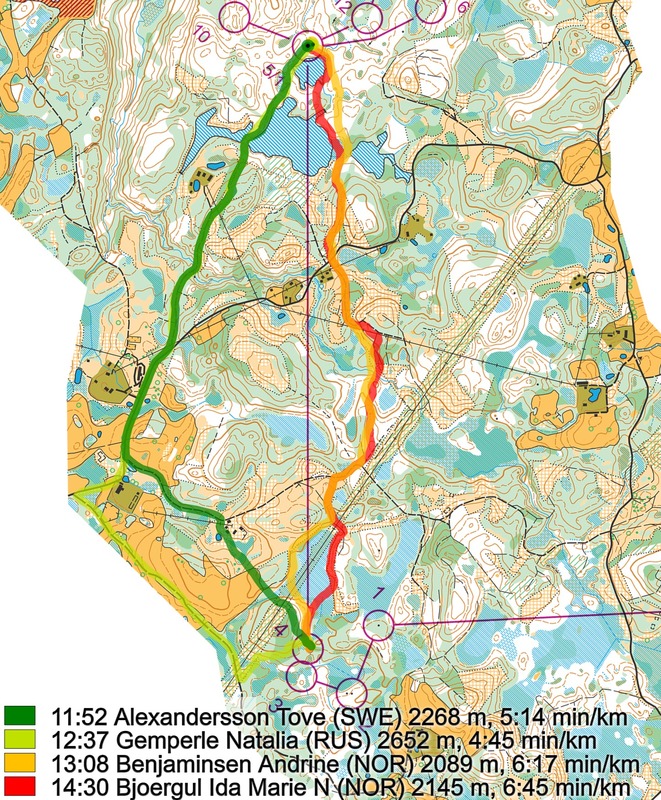 start out along Alexandersson’s route, and then turn left on the big path. A short leg to the 2nd control, and again time by two of the Norwegians, both Benjaminsen and Bjørgul loose nearly half a minute on this 1:30 leg. On the long leg to the 5th control several top runners lost time. 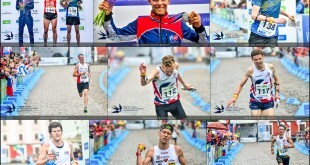 Again the two Norwegians took the wrong choice and ran straight; Benjaminsen losing 1:17 and Bjørgul losing 2:39. 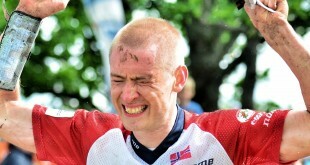 Bjørgul is in 22nd place at this point in the competition, more than 6 minutes down. The two Swiss Sabine Hauswirth and Elena Roos also loose significant time here; Hauswirth with 1.32 and Roos with 1:06. Roos and Hauswirth did run to the left though, and lost time due to non-optimal execution. Several loose half a minute on the forked control (note that the total times are based on when they actually were on this control, and thus they can not be used for comparison within the forking. Leg times are comparable, though). To control 7 Sabine Hauswirth loses more than a minute (this is actually her 12th control, as it is on her second time through the center of the phi-loop) – now the Swiss has lost nearly 2 minutes on two controls. Add this to the 1:30 lost to control 5, and we are at 3:30, more than she was behind the bronze medal in the end. So Hauswirth does not have a big mistake which takes the bronze medal from her, but several smaller. 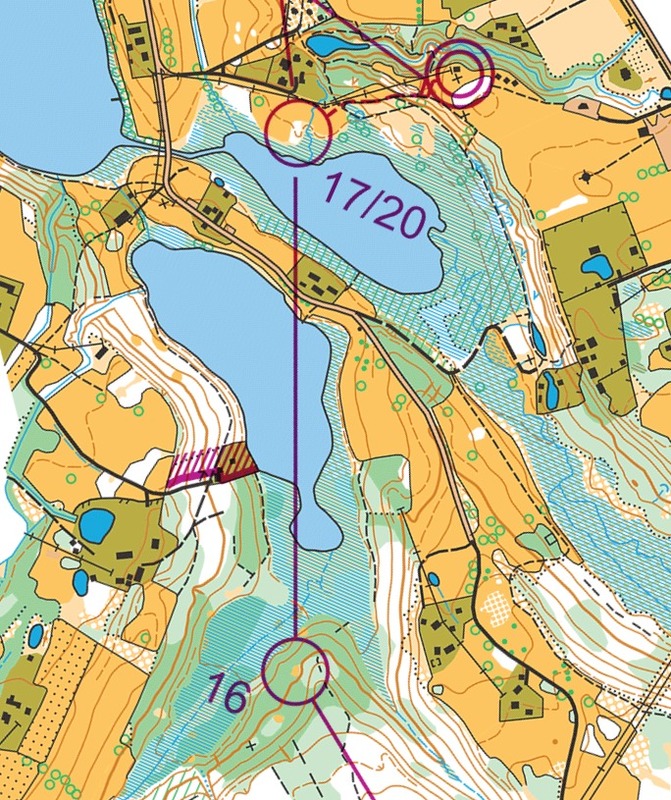 Several of the women loose time to control 8 – notably Bjørgul again has nearly a minute time loss. 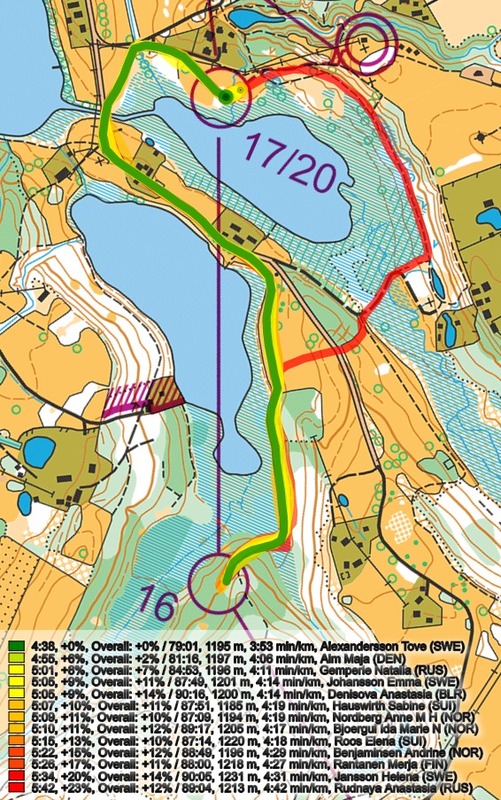 This is also one of the few controls where Alexandersson looses time – 37 seconds to best split time. To the 9th control it is Emma Johansson’s turn to loose time and the chance to fight for the bronze medal – 1:46 lost. Another Swede, Helena Jansson, looses 6 minutes here – going from bronze position and far out of the medals. The 10th control also proves to be a tricky one for many – many of the runners in Top 10 loosing 1 minute or more. Sabine Hauswirth notably looses another 1:43 here. This is mostly about choosing wront micro routechoices – Hauswirth in addition runs too far to the right where runnability is worse, and she has to cross a deep gully which costs extra time. To control 16 we again have big time losses due to non-optimal route choices – most notable Anastasia Rudnaya losing more than 4 minutes and going from a 3rd place to an 8th place (running to the left). Roos, Bjørgul (straight but bad execution) and Benjaminsen (right) all loose more than a minute; Hauswirth (left) and Hausken Nordberg (left) loose more than 2 minutes! Hausken Nordberg’s time loss took her out of the medals at this point in the race – and she never managed to get in again. This “sprint trap” fooled a few, but in the end was not decisive for the medals.